The Most Ergonomic Office Chair Ever! People who maintain a sitting posture for long periods are most at risk of back pain. In developed countries, 80% of workers suffer from musculoskeletal pathologies, the most common reason for missing work. Even though their office chair is the place they spend the most of their working life, employees rarely pay attention when they choose their seat—and that’s if they get a choice. 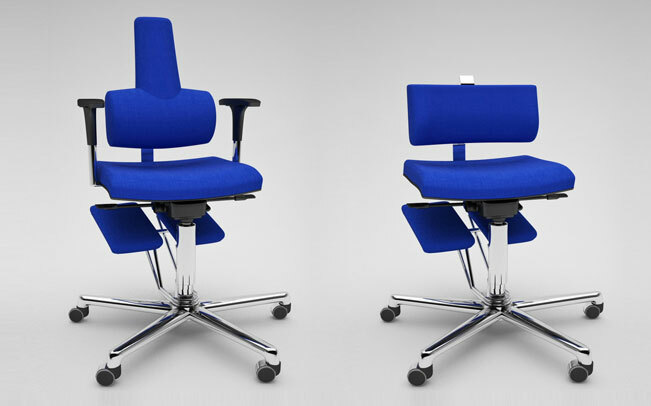 The ordinary office chairs are still the most common sight in front of screens, even though it is impossible to use them in an ideal position. In fact, chairs whose seat and back support are at 90 degrees generate high pressure on the lumbar vertebrae, an unnatural posture that affects the spine and causes musculoskeletal pain. KomfortChair uses a revolutionary new design that delivers huge benefits compared to conventional chairs. The most important benefit is the constant distribution of pressure on back muscles, reinforcing them and ensuring a relaxing feeling. Thanks to the ability to change the leg position from Standard to Ergonomic, KomfortChair improves and stimulates blood circulation, reducing the feeling of heaviness and swelling in the lower limbs. The incredible Ergonomic Cushion straightens the spine, opens the chest and encourages better breathing. You will really notice the difference especially after a lunch break! The compression of the abdomen, as experienced when sitting on ordinary chairs, is visibly reduced. Thanks to the combination of all its Ergonomic Elements and the ability to adjust each of its parts, the KomfortChair is definitely one of the best office chairs on the market, recommended by orthopedic consultants and physiotherapists for the prevention of disorders related to bad posture. Did you buy a Komfort Chair and now want help to set up your workstation? Every KomfortChair customer is entitled to a free postural advice session with our ergonomic experts to help them properly set their workstation. In order to obtain your free advice, just send us a photograph taken while you are sitting on your KomfortChair. You should be in your workplace and the picture should be shot from the side. Within 24 hours you will receive our advice regarding the proper configuration of your workstation and will be able to set perfectly your chair, monitor, desk and tools.